Discussion in 'Videocards - NVIDIA GeForce' started by Mda400, Mar 24, 2019. Bought it at my local MicroCenter store and cross-flashed the XC Ultra bios since it had the highest power limit I could find out of any 1660 bios (123%/160w). 0db fan mode works as well, which this card doesn't come with by default. 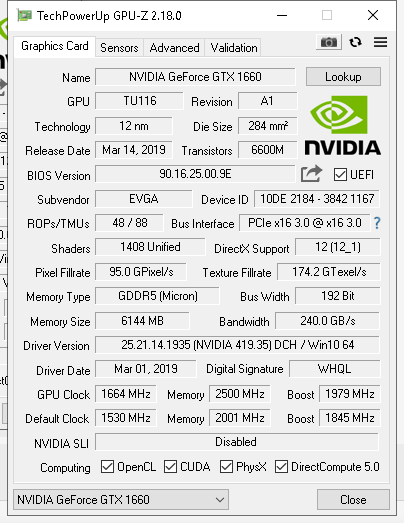 100% overvolt, 123% power limit, 90c temp limit, auto fan mode, core clock +134 (Hovers between 2085-2115mhz in most 3D apps, 2025-2040mhz in Furmark), and memory at +999 (10ghz). Highest temp I observe is 72c at ~2400 rpm / 67% fan speed (when it reaches the power limit in Furmark). If I go above 134+ core it crashes after a few seconds to a few hours, depending on the application. If I go to +1000 memory it becomes unstable on desktop. Awesome to see that this GDDR5 can overclock this far from 8ghz. Cool man. The 1600 series is the best bang for your buck at the moment.